LGBTQ culture and rights are covered through the prism of Pride in this timely work. Beginning with gay history, Stevenson explains how Pride events began as a way to commemorate the 1969 Stonewall riots but have gradually shifted from focusing on gay liberation toward a celebration of gay pride. Yet while Pride events are held all over the world, whether small parades or weeklong celebrations, there are still struggles within the LGBTQ community and against those who identify as LGBTQ. But with the work of activists of all ages, Pride and LGBTQ rights can prevail against homophobia and other forms of discrimination. 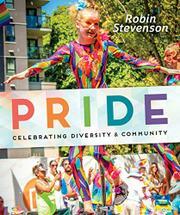 Using Pride as a way to talk about LGBTQ gives the information a new slant, yet Stevenson may confuse readers by vacillating between subjectivity and objectivity. She frequently uses the personal pronoun, flipping, even within a paragraph, from “some people wanted” to “we should,” muddying the waters a bit: is this a memoir or a piece of cultural and historical nonfiction? The appropriately rainbow-themed design features plentiful photographs, both black-and-white and color, in a lively design. They’ve been carefully chosen to highlight the diversity within the community, from First Nations drummers in a Vancouver parade to an Asian man holding hands with a white man in an Oslo celebration.